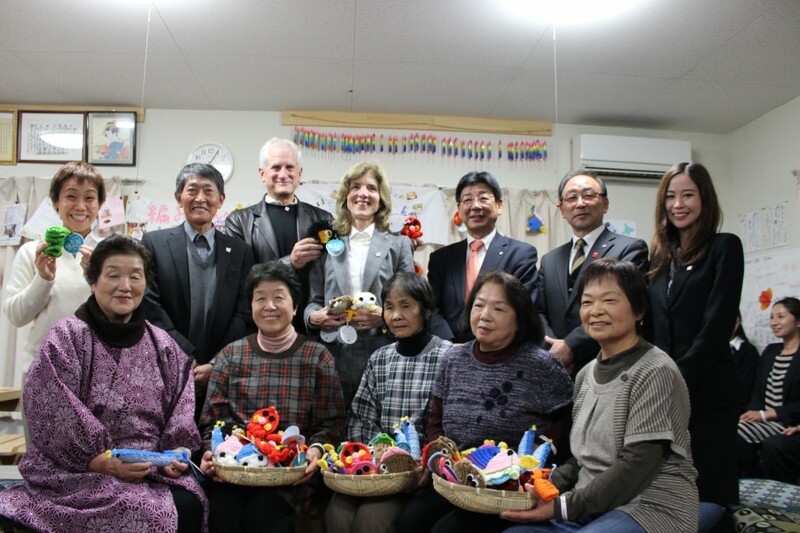 On November 25, 2013, Ambassador Kennedy visited the Nakasemachi temporary housing facility in Minami-Sanriku, Miyagi prefecture, where she sat down to talk with women who had survived the devastating tsunami on March 11, 2011. One of the reasons for this visit was to spotlight an NPO leader – Megumi Ishimoto of Women’s Eye – who went on the TOMODACHI NPO Study Tour supported by J.P. Morgan earlier this Fall. Women’s Eye empowers women to become entrepreneurs and helps to create sustainable small business models for women throughout Miyagi Prefecture. 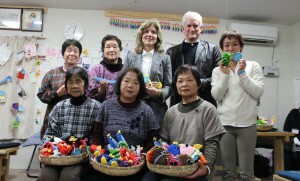 This knitting project in Nakasemachi was where her organization founded its roots to grow to where it is today. 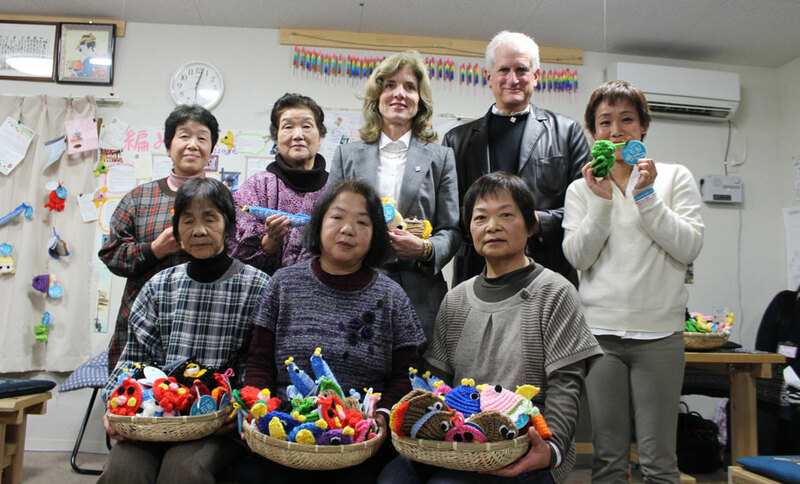 Now, the women knit eco-friendly scrubby buddies (scrubbing pads) in the forms of various sea creatures, which are available for purchase. 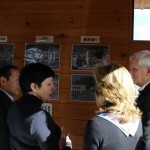 Upon arrival, the Ambassador was greeted outside the temporary housing facility by MinamiSanriku Mayor Jin Sato, Vice Mayor Kenji Endo, Shizugawa Area Leader Tokuro Sato, and over 100 residents who patiently waited for a glimpse of the newest Ambassador to Japan; and she did not disappoint as she made her way along the crowds shaking hands with the residents before entering the community space. 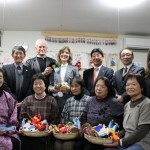 Once inside, she was greeted by Megumi Ishimoto (Director of Women’s Eye and TOMODACHI program participant), Emiko Manners (Vice President of the CSR Division at J.P. Morgan), and five women who were part of the knitting group that create these eco-friendly scrubby buddies (called eco-tawashi in Japanese). 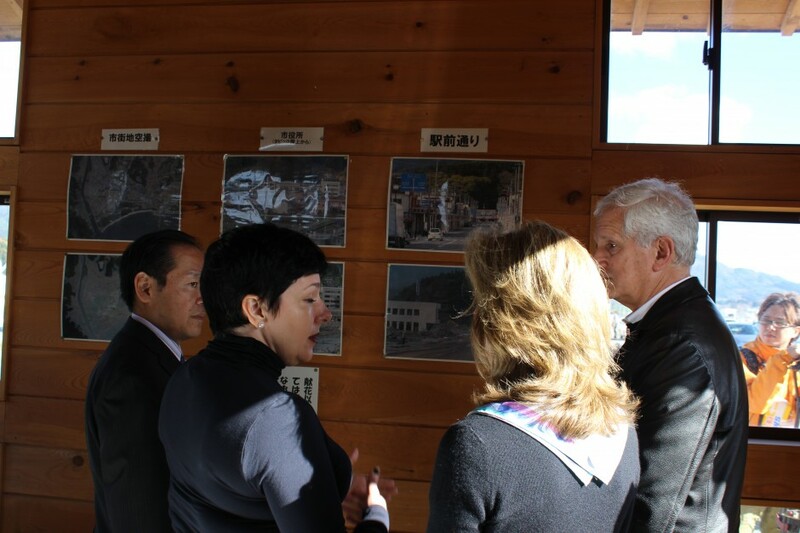 The Ambassador’s trip to Tohoku highlighted the ties of friendship between the United States and Japan.